The perfect destination to put a little distance between yourself and the outside world… Rose Cottage is an exquisite home, offering beautiful detailing, lovely views of the mountains and the sea. With two spectacular swimming pools, (a 75ft infinity lap pool and a heated garden pool), charming gardens and stylish interiors, Rose Cottage is perfect for families, a group of friends or a corporate retreat. 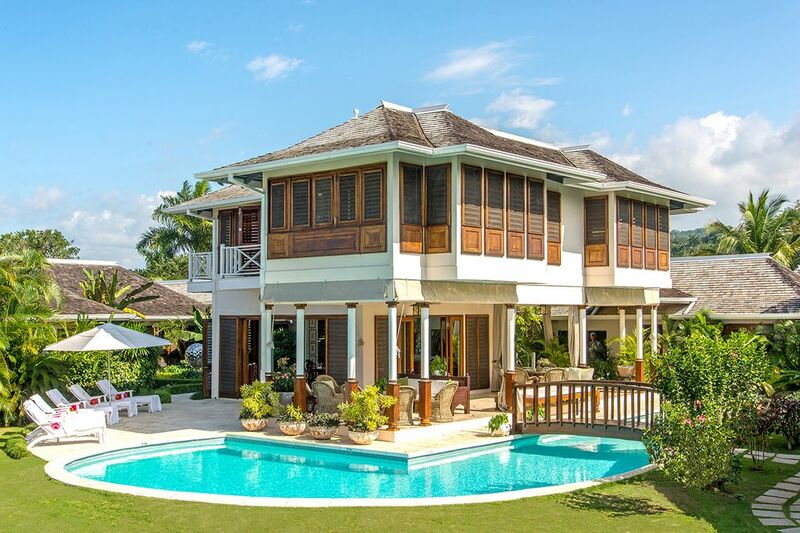 Rose Cottage, designed by Nancy D. Maffasanti in the old traditional Jamaican style, is decorated in an elegant arrangement of themes influenced by Asia, Jamaica and Europe. The house is elegant yet comfortable and meant to be enjoyed. This lovely villa is perfectly sited on 3.4 beautifully landscaped acres with six (6) pavilions, one of which is a two story structure with a magnificent bedroom suite with bird’s eye views down to the Sandy Bay coastline; a 1,900 sq. ft. master cottage with a private veranda, the main house with four palatial bedroom suites (two bedrooms with king sized beds and two with queen and full sized beds); and a formal dining and pool-side dining pavilions. Rose Cottage is located within the Tryall Club with it’s world famous golf course, tennis facility, private beaches, restaurants, kids club and resort’s amenities all accessible within a 3- 4 minute golf cart ride from the villa. The main house has four palatial guest suites, an ample living room, an open family room and study. Of the bedroom suites, there are two comparable masters with King sized beds, of the other two bedrooms, one is furnished with two Queen sized beds and the fourth bedroom has two full sized beds. The second floor Master Pavilion bedroom suite occupies a stunning position above the living area with a 360 degree view of the property, brilliant Caribbean ocean and at night, the lights of the nearby village. A private sitting room equipped with audio/visual equipment and the beverage center makes it a unique private escape. Rose Bud, the sixth bedroom suite is a 1,900 sq. ft. cottage with a full befitting bathroom with Jacuzzi, large open shower, a sitting room equipped with audio/visual equipment, beverage center, a full bathroom directly accessible to the sitting room and study. The study is equipped with a queen sized murphy bed. Rose Cottage’s many pavilions are designed to promote the efficiency of natural ventilation. There is a formal living room, open formal dining room, an open study and open family/great room which is a great gathering spot, as well as provides wonderful views of Montego Bay. Outdoors, there is a 75ft. infinity lap pool and a heated wraparound garden pool which envelops the south side of the dining room. A beautiful adjacent pavilion provides lounging or dining that take full advantage of the spectacular sunsets. Rose Cottage may be rented with 4 or 5 bedrooms during the summer season. Your private villa staff consist of a chef, a butler, two housekeepers, a laundress and two gardeners.